It's been raining non-stop for days now here but that's no excuse to skip wearing sunblock. I must admit, i used to hate wearing one because of the greasiness and the white cast it leaves on pictures. I remember posting my HG sunblock months ago, but it won't hurt to have another one, eh? 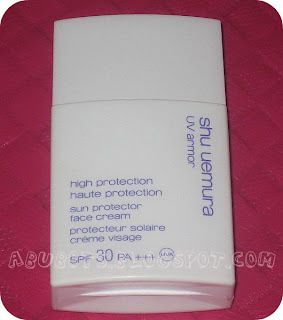 I was lucky to have the chance to try out this sunblock from Shu Uemura. I gave it to my mom thinking that i must stay away from using too expensive stuff so i'll be saved a lot of moolah just in case i get used to it. Besides, i already found my HG and mom would love getting this one. She loves Shu and Shiseido stuff! not greasy at all! i just dunno with the other variant with SPF50. but i am such an oil mine and this one doesn't aggravate it. lightweight and gets easily absorbed by the skin. unlike other sunblocks, this one melts right into your skin. skin feels refreshed and smooth. imho, this can work as a great primer too! a little goes a long way. 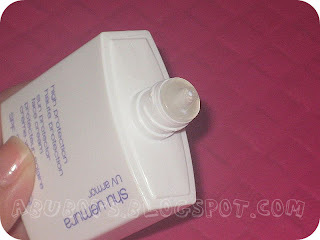 the consistency is liquid-y but you'll know when you're covered enough...my mom have been using it for more than 2 mos (and i use it when i get home...now i regret giving it to her...lol!) and we're not even close to finishing up the bottle. 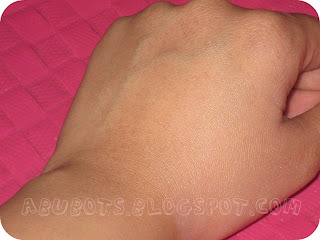 leaves a whitish cast on the skin...but it goes away after a bit. aside from those two, i have no other reason to stop me from getting myself my own UV armor. and this time, i won't be handing it over to mom....LOL!